Stems stout, erect or nearly so, smooth, pale green and glaucous, rarely somewhat pubescent, 2 to 3 feet high. 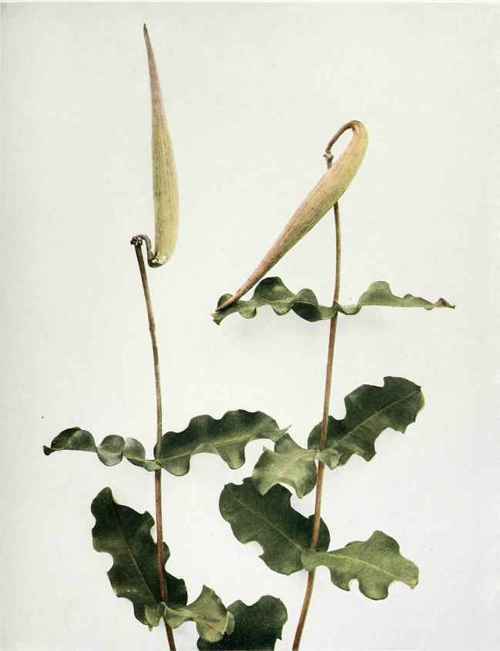 Leaves opposite, oblong-ovate or oblong, blunt and minutely pointed at the apex, cordate-clasping at the base, 3 to 5 inches long, 1 to 2 inches wide, the margins wavy-crisped. Flowers numerous in a terminal, solitary, long-stalked umbel; pedicels of the flowers downy, about 1 inch long. Flowers greenish purple; corolla segments oblong, about one-third of an inch long; column thick, hoods pinkish, shorter than the subulate incurved horn. Fruiting follicles 4 to 6 inches long, erect on recurved pedicels. In dry, mostly sandy soil. New Hampshire to Minnesota, south to Florida and Texas. Flowering in June and July. Young plants of this and other species of milkweed are said to make excellent greens. The Intermediate Milkweed (Asclepias intermedia Vail) has been found only at Lawrence, Long Island, and is probably a hybrid between A. syriaca and A. amplexicaulis.